Chief Fire & Rescue Officer, Gary Thompson, has been shortlisted in the Public Sector Director of the Year category in the prestigious Institute of Director Northern Ireland awards. Congratulating CFRO Thompson on reaching the shortlist, Northern Ireland Fire & Rescue Service (NIFRS) Chairperson Carmel McKinney, OBE said, "This is a great honour and testament to the significant strategic contribution that Gary made to the organisation in his role as Director of Operations. 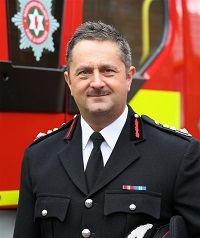 “During this period he developed a new Integrated Risk Management Plan to ensure that NIFRS appropriately deploys its resources in response to identified risk. The associated risk methodology has recently been recognised as industry best practice. This ‘resource to risk’ approach has enabled the delivery of significant organisational change in partnership with key stakeholders, including the introduction of new crewing arrangements. He also successfully introduced a new Emergency Medical Response pilot in Lurgan.